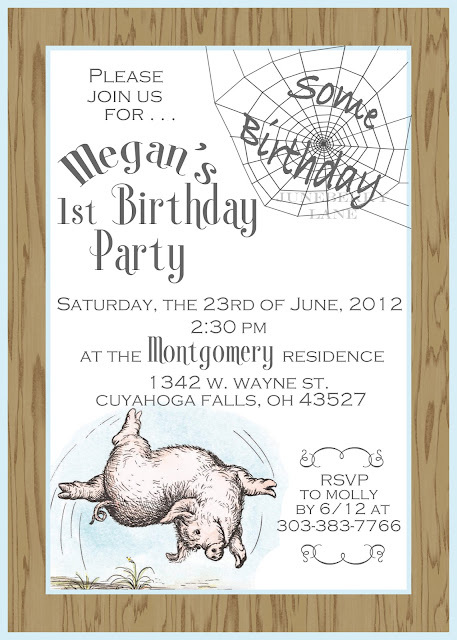 Juneberry Lane: Our New Charlotte's Web Birthday/Baby Shower Invitations Have Arrived!! Our New Charlotte's Web Birthday/Baby Shower Invitations Have Arrived!! Well, as promised just a couple of short weeks ago, here is the new invitation for the Charlotte's Web Party that we talked about; available now in our Juneberry Lane Etsy shop and all ready to be customized for your special event . . . If you happened to miss this post and you need a little party inspiration, just take a look at it here . . .
As always, you can custom order ANY theme you are looking for just by sending us a message in our shop!! Go ahead and get creative and we will be happy to help make it happen!! I LOVE this invite!!! SOOOOO Cute!! Hi, thanks for sharing this cute and professional baby shower invitation with us. I maintain a website about them as well. Would you please consider adding a link to my website on your page? Please email me back. Preparing baby shower invitations is an incredible way to show you and also your partner's excitement to become parents. Express your creativity. Don't be frightened to experiment. Remember that having a baby is an enjoyable part of being a parent. Well the invite is perfect and that pig is nice on it.